Voters in the Emmett Independent School District will be asked May 21 to replace an expiring Maintenance and Operations Levy for the next two years. Governor Brad Little has chosen to hold his first “Capital for a Day” event since becoming Idaho’s 33rd Governor in his hometown of Emmett. Lillie Payne, owner and operator of Tom’s Cabin Cafe, presented a check of $1,400 to the Emmett VFW Post 4900. The check represents the profit made from the St. Patrick’s Day Annual Fundraiser. 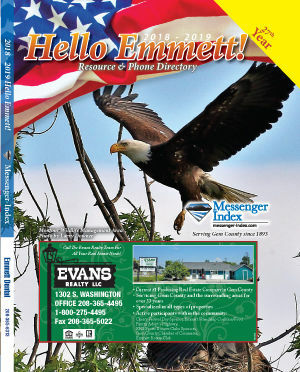 In March 2019, 24 homes sold in Gem County, up 33.0 percent from March 2018. This left 39 new and existing/resale homes available for sale at the end of the month, down 4.9 percent from a year ago. Sign up today for one of our great newsletters and get headlines right in your inbox every morning. Two soon-to-be graduates, who each etched their name in the EHS sports record books during their high school careers, signed national Letters of Intent last week to continue their educations in college. They may be underclassmen but sophomore Lacy Yates and freshman Landon Helms led the Emmett Huskies efforts in an elite field Saturday at the Nike Boise Relays at Dona Larsen Park. Each not only won their specialties, they each also erased Emmett High records in their respective events. When Rich Hargitt decided about a year ago to accept the head football coaching position at Emmett High, moving his young family across country from South Carolina, he felt he was making a decision for his family and not just for football. Nearly 400 Emmett youngsters are currently playing spring soccer on the fields at the Gem Island Sports Complex. While the soccer program is underway, registrations for tball, kickball, baseball and softball are continuing through this week. The Huskies took only five athletes to the Idaho State 4A track and field championships last spring. Four of those elite performers return this season for coach Jim Hines and they will be joined on the track and in the pits by an infusion of young talent that has the veteran coach excited. The Idaho Department of Fish and Game is using “green” power, but not where you might expect it. Mule deer bucks currently roaming the backcountry are sporting solar-powered ear tags that allow biologists to track their movements without worrying about draining a battery in a telemetry collar. Your email address will not be published or shared, this is strictly so we can send you a confirmation. Your information has been submitted for inclusion in the next phone book and is available online now. If you have any questions, or need to make a change, please contact us at 208-365-6066. Will you be attending the Capital For A Day event today at City Hall? Thirty-two Emmett High students were inducted into the EHS Honor Society in March. The latest induction ceremony brings membership in the organization to 79. One of Gem County’s older seniors who still loves to paint is 99-year old Grace Tilley. She loves birds and loves to paint horses. Many of the residents of Apple Valley have her horse paintings on their walls. The Valley of Plenty Quilters presented a $ 500 charity donation to Rose Advocates on Valentine’s day, Feb. 14. Pictured left are Toni Judy, Rose Advocates; Nancy Puccio, current President of Valley of Plenty Quilters; and Ellie Alsoufi also of Rose Advocates. This coming Saturday, I’ll probably be right here in New Mexico. Well, most of me will. But my heart and my wishes and part of my soul will be many miles from here, up in Anchorage, Alaska.